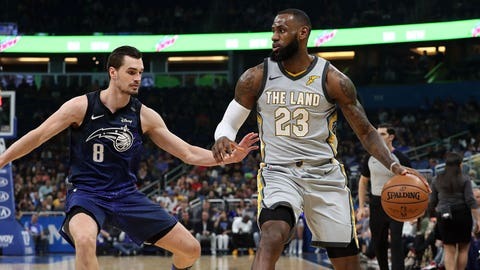 ORLANDO, Fla. (AP) – Jonathon Simmons scored 22 of his career-high 34 points in the third quarter and the Orlando Magic overcame a 21-point deficit Tuesday night to beat the reeling Cleveland Cavaliers, 116-98. The Cavaliers scored 43 points in the first quarter, but then went almost 6 1/2 minutes without scoring in the fourth and lost for the 14th time in 21 games. They played the second half without coach Tyronn Lue, who went to the locker room in the second quarter with what the team said was an illness. LeBron James had 25 points, 10 rebounds and five assists for the Cavaliers, but did not have a rebound or an assist in a foul-plagued second half. Evan Fournier scored 19 points for the Magic, who broke a nine-game home losing streak against Cleveland. Simmons made seven of eight shots in his 22-point quarter, finishing the period with a 3-pointer at the buzzer to tie it at 92. J.R. Smith made three 3-pointers in the first four minutes to help the Cavaliers (30-22) take a 15-4 lead and they led by 21 points late in the first half. Cleveland shot 15 for 22, including 5 of 8 3-pointers, on its way to a 43-point first, the most points Orlando has given up in any quarter this season. James opened the second half with a couple of 3-pointers to regain a 16-point lead for Cleveland, but Simmons scored 12 points on the Magic’s 19-2 run that gave them their first lead of the game at 78-77 with 5:33 left in the third quarter. Dwyane Wade banked a 3-pointer for Cleveland’s only points of the first 7:25 of the fourth quarter. Cavaliers: Wade missed the morning shootaround due to illness but played 22 minutes.